I love a good deal, but I love a good rummage sale find even more. Last summer I stumbled upon this sturdy wood end table and tall ornate lamp at the same house for $10, I had a vision. Months later I decided this combo would be perfect in Baby Girl’s room. Just needed a little work. I took the easy project first; the lamp. I cleaned it up and sprayed it with a white primer then 2 coats of the coral wall color (Behr Cool Melon 170B-4). Then I added a simple white shade. The table took a little more work. As much as I enjoy a good rehab project, cleaning a piece of furniture that has been in my garage for 6 months and someone else’s basement/garage for who knows how long is a little intimidating. If it wasn’t so cold I would have come across all kinds of living things, but thankfully I just came across formerly living things (yuck!). After cleaning it up the drawer needed a little TLC to work properly. I removed the handles and sanded a couple rough spots on the wood. Then I primed it with my fave primer Zinsser Primer (affiliate link). I used the spray version this time around, just for kicks. Coverage was great, easy to get into all the corners and grooves. This is a stain blocking primer which will help the bright white paint stay white and not allow any of the stain to bleed through. Once cured I added a couple of coats of Behr Semi-gloss Ultra White paint. I used a small foam roller to apply the paint. This doesn’t leave any brush strokes and allowed me to get into the all the crevasses on the piece. The handles are old school, but were in good shape so I cleaned them up and sprayed them with a Metallic Nickel paint for an updated look. I paired these two pieces together in between the glider and crib. 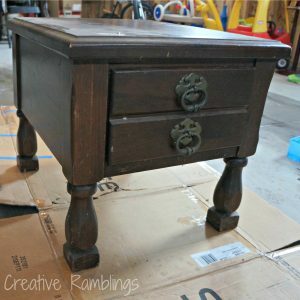 It’s functional (a big deep drawer and lots of space on top), and super cute too! 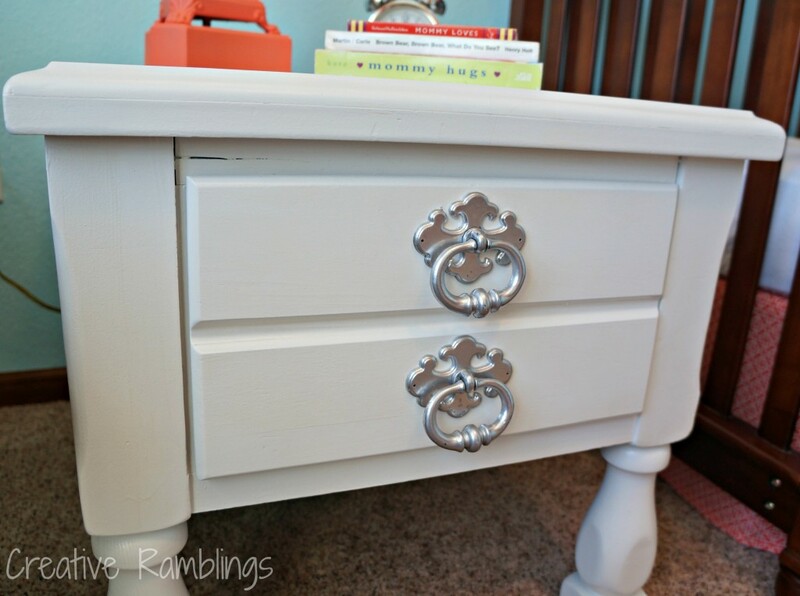 I loved this re-do, it’s always nice when the pieces have good bones and are functional from the get go. What has been your favorite re-do? Like this post? I would love for you to Pin it. 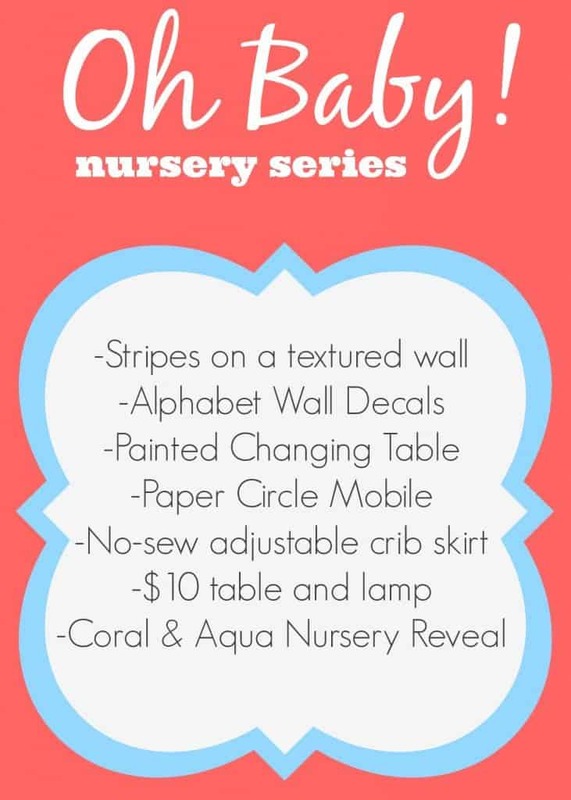 Want to see more projects from the nursery? Click on the picture below for the full series. Awesome Meredith, I love planning for girl’s rooms. So glad I could offer some ideas. Great job! 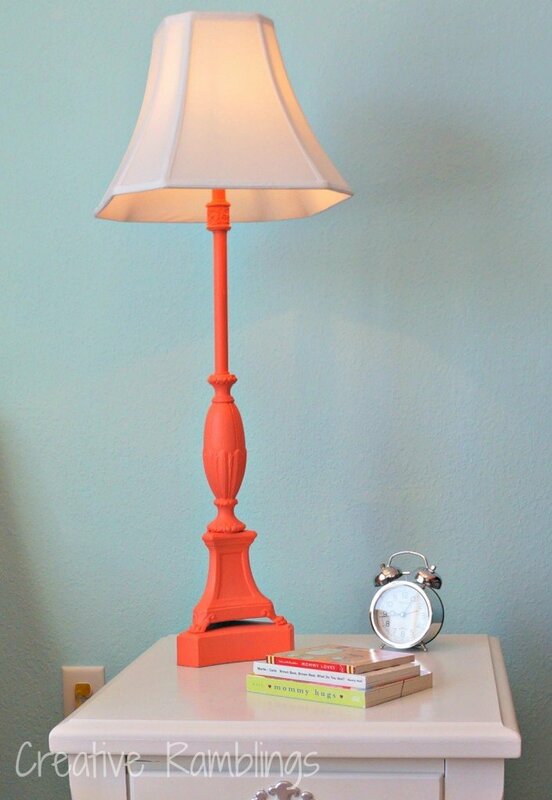 Love the color on the lamp! That’s a great redo! 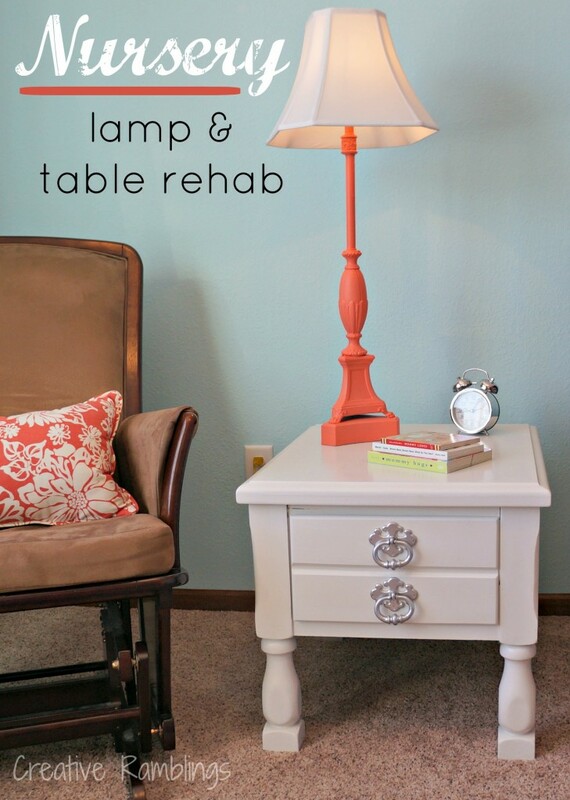 I like the chunky legs on the table and the color of the lamp is beautiful! Awesome job! Thank you Abby, love when a piece has good bones from the start. Whoa! 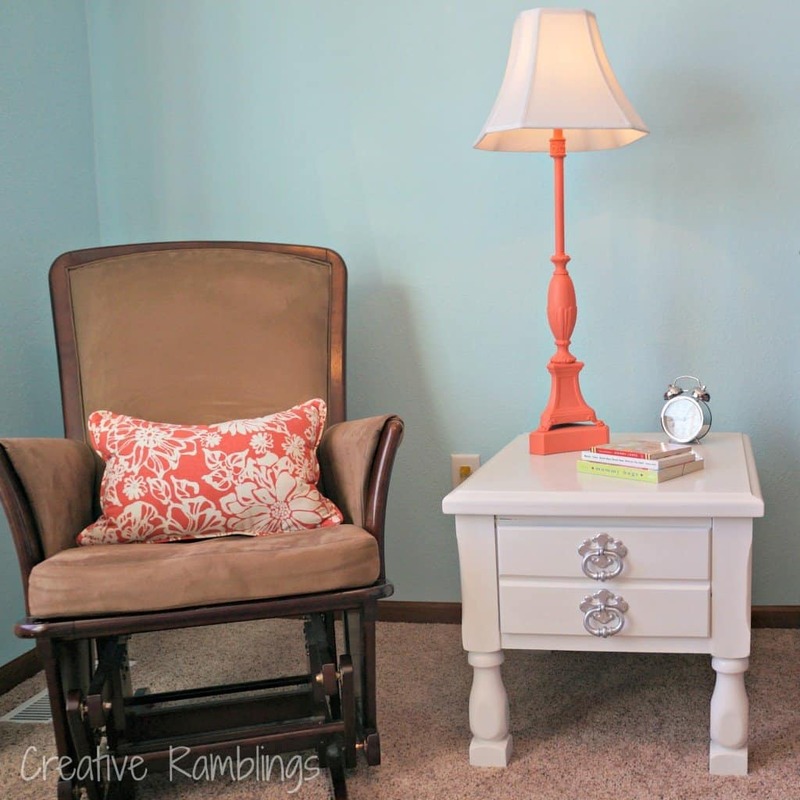 Love that coral lamp and the side table looks great in the space!